A fellow owner has contacted me to say that he’s now offering 3D printed dust covers. These are often lost or broken so missing when PS-F5/F9s are offered for sale. Currently available in white or black (the original was a navy blue). This should fit both the PS-F5 and the PS-F9. Can’t find a PS-F5/9? This looks to be a good alternatve at a reasonable price. After a successful Kickstarter campaign earlier this year, it is now available for general purchase through their website (link below). Way better than some of the budget vinyl wreckers that are on the market. Did they take the vertical inspiration from the Sonys? Seems I’m not the only one who made the connection. Reading through pretty much the whole thread has just convinced me to throw away many hundreds of PVC sleeves that I’ve had my most prized/expensive records stored in. Searching around, this knowledge has been around for a while, but none of the people I’ve spoken to who collect records were aware of the issue, so it seemed sensible to write this post to help spread the word. If you can’t be bothered with reading through the whole thing, I’ll summarise: it’s mainly the outer sleeves that are the issue- the thick, fairly rigid ones, normally textured around the edge. Yep- the very things that we’ve bought to protect our records could be irreversibly damaging them. The consensus seems to be that something (plasticisers, oils?) 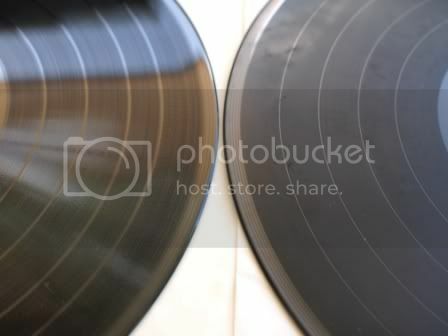 is leeching out of the PVC, transferring through the cardboard & inner sleeves (even plastic inner sleeves in some cases) over time and affecting the vinyl of the record itself. This is referred to by some as “off-gassing” or “out-gassing”. Some people say that plastic inner sleeves are a potential problem too. Acid free paper inner sleeves are safest from a chemical perspective. Other people avoid paper like the plague due to the the dust it transfers to the record. It seems the whole subject of record preservation is a minefield. Sure, it’s inconclusive and seems to be more likely in hotter/more humid climates and seems to depend on the manufacturer of the record, but there’s around 10 people from around the world in the thread that I linked to above that have lost lots of records from having them stored in PVC sleeves. I decided the safest bet is to ditch all of mine. Just not worth the risk. Thin polythene sleeves like they often have in record shops are fine. Mylar (trade name for polyester) are the best, but expensive and hard to find. According to people in that thread who sound like they know what they’re talking about, the most inert and cost effective are polypropylene. I’ve just bought 100 of these to try and I prefer them to the polythene sleeves as they are slightly thicker, so don’t tend to slide off so easily when putting records back into place on the shelf. I’ll be getting more. Sadly, the PVC sleeves are still widely available. I used to prefer them as they offer more protection to physical damage. Let’s help spread the word about these potential vinyl killers. Please pass this on this to anyone you know who collects records. Too much vinyl has been lost already. VG+ – PVC sleeves damage vinyl? 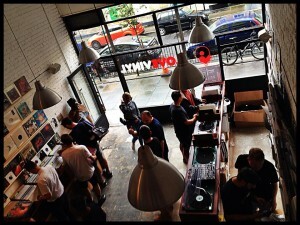 Great article on Gilles Peterson’s Worldwide website about some new record shops that have recently surfaced in London Town. Sales of vinyl LPs reached a 15 year high in 2013 thanks to Record Store Day, and new albums from the likes of Arctic Monkeys, Daft Punk and David Bowie. Recently spotted this doing the rounds – some great info here. Having trouble finding the source of this, but well worth a post.